Typhoons and the Philippines | LIVING IN THE PACIFIC - Philippines to Guam... One Day at a Time! Typhoons and the Philippines – LIVING IN THE PACIFIC – Philippines to Guam… One Day at a Time! Recently, I received a comment from a friend about typhoon landfalls in the Philippines. His comment revealed his own assumption that most typhoons landed on the island of Samar. Years ago when I lived in the Olongapo City area, my job was as a Weather Forecaster assigned to the Naval Oceanography and Meteorology Command Facility, at Cubi Point U.S. Naval Air Station. One of our primary functions at that office was to provide weather forecasting services for the Commander, Naval Forces Philippines, and in coordination with the official Philippine organization now named thePhilippine Atmospheric, Geophysical and Astronomical Services Administration or PAGASA. The purpose of our forecasting effort there was much more than just military and strategic and also involved services directed at the protection of life and assets there and throughout the region. The two major weather events that kept us the most busy were the seasonal southwest monsoon and typhoon forecasting and tracking. So when my friend suggested Samar as being the center of typhoon alley, I had to take back and do some quick research. Although Samar Island is one of the more eastward located and facing islands, it’s proximity in the archipelago only means that if a storm does in fact hit the central Philippines, Samar will usually be the first to feel the effects. But, this does not mean that all storms touch Samar. On the contrary. 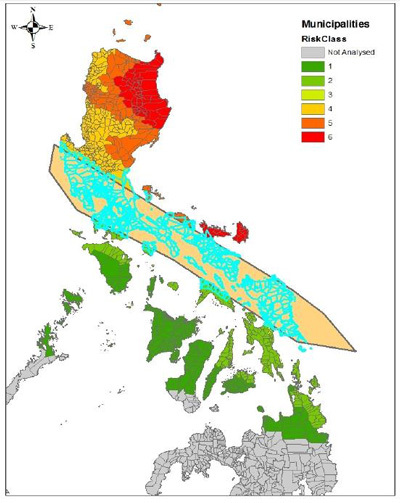 Luzon, the northernmost and largest of the Philippine islands, is the largest target for the majority of developed storms that track through the region. As you can see from the graphic above, storm intensity and frequency are historically assigned tracks to areas of the Philippines. The farther north you go, the higher the “risk class” of damage and destruction from storms. And likewise, the farther south, the safe one becomes related to any strong storm scenario. Of course, there will always be deviations from the norm – take Typhoon Bopha for example. The second such dangerous storm to hit Mindanao in two years. Looking at the 2012 storm track chart above, and with all atmospheric ingredients and scenarios considered, the best that can be said for where any storm will go, well…let’s just say that it’s all in the outcome of Mother Nature’s roll of the dice. There is nowhere in the Philippines that is completely safe from typhoons. This entry was posted in In the Philippines, Officially Speaking, X,Y, & Z! and tagged Bagyo, cyclones, destruction, flooding, Philippines, samar, thypooons, waves, western pacific storms, where to live, wind. Bookmark the permalink. I was going to say that I think most of the typhoons hit Luzon, so I agree that your information is accurate. Even when the typhoons do hit Samar, we here in Calbayog City never get a direct hit since we are on the opposite side of the island. That is why most all islands within the tropics (typhoon belt) with eastern facing exposure are much less developed than the western coasts of those same islands. Look at Guam and most of the Mariana’s Islands as a good example.